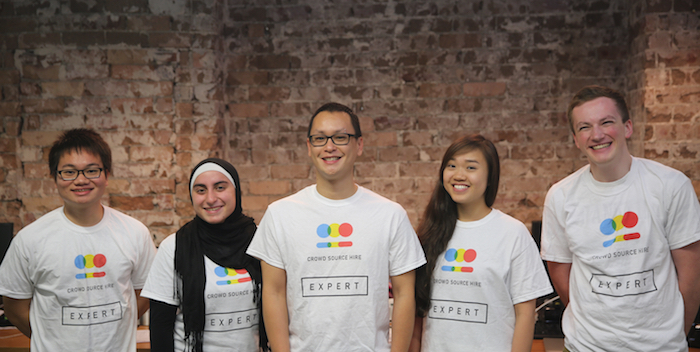 Sydney based startup CrowdSourceHire is preparing to graduate from the muru-D program this month. Founded by Ben Liau and Desmond Hang and Raj Kumavat, CrowdSourceHire targets small and medium sized enterprises and allows these companies to hire the right people by assisting them with their pre-hire evaluations. The core focus is on the software and web developer space. Liau told Startup Daily that the muru-D program has been really good for the CrowdSourceHire team, and that it helped the founders zero in on some much needed clarity of the company’s unique selling points. “The muru-D program has been really good for us. We started off with an idea that we were really passionate about and through the course of almost six months that we’ve been through, we’ve chatted to a lot of experienced guys in the industry, a lot of great mentors and advisors and that’s [helped us gain] clarity in terms of what we’re trying to do and the problem we’re trying to solve,” says Liau. “We tested out a lot of hypotheses as we went along with the six-month program and tested a lot of things that we thought about but hadn’t gotten proper validation around. We made a lot of contacts, [formed] great partnerships, and we also have a great team of advisors on board at the moment”. One of those advisors happens to be the ex-CTO of NineMSN and current API evangelist at Telstra Frank Arrigo, whom Liau says has been extremely helpful in opening up some rather large potential doors for the growing startup. At the moment, CrowdSourceHire is specialising in the software development vertical in terms of the chosen job market it is applying the technology towards. Other verticals are also on the cards in the not too distant future. Liau told Startup Daily that these verticals would most likely still be in the digital space; but first to roll out would be verticals in IT, engineering and finance. “At the start, we were kind of thinking, maybe startups are our target market and then we kind of realised that startups don’t have a lot of money, funny enough,” said Liau. “We targeted enterprises where we have a couple of customers and obviously it’s long periods of times in terms of actually getting them on board so we tweaked our model in a specific way where we actually made our tools free to use for pretty much businesses of all different sizes but have an ‘expert’ component payable”. Essentially what this means is that a majority of users that would be attracted to the CrowdSourceHire platform would be considered ‘not proficient’ in the skills that are needed within the business they are working for. To give you an example, if I wanted to build a specific software solution for my business, and I know that I need to hire a developer for that project – I probably wouldn’t know what type of questions to ask the candidates that apply for that role or assess their skills because I have no knowledge or skill set in that space. If there was someone that was technical in my business that could assist with the hiring process, that person could use the free CrowdSourceHire tools to test and assess those candidates. However, if such a person did not exist in my company I could use the paid CrowdSourceHire ‘expert’ service and have a dedicated individual review my top candidate choices and test and assess them and then advise me on who they think would be best for the role from a technical perspective, minimising the risk of me making a bad hiring choice based on lack of skill set. The experts come from a pool of people that are working full-time in the industries they are ‘expert’ in and consult on CrowdSourceHire for some supplementary income. CrowdSourceHire has created a proprietary assessment framework that tests three main things on candidates applying for roles. The first is the knowledge of the candidates, the second is the application of that knowledge and the third is the communication of those candidates. As part of this assessment process, candidates actually work on small projects that are related to the job they are applying for. For example if a company needed an iOS developer, they would assign the candidate a small iOS project, such as designing an app with minimal functions, something that takes less than an hour to do. After creating this, the candidate is then asked questions (which are video recorded) that are related back to the product they have just create. Such questions include “What kind of design patterns did you use?” or “Why did you code this project in that way?” These questions test their abilities to communicate back to non-technical people what has been created and why – important soft skills to have in any sized organisation. The traction that CrowdSourceHire has been getting is impressive. While names of specific companies given to Startup Daily need to remain off-record until after the muru-D demo day this Thursday, we can tell you that some key customers some pretty large technology businesses in Australia as well as one of South-East Asia’s fastest growing companies. So far, approximately 500 candidates have been put through the CrowdSourceHire platform by users. It wouldn’t be surprising if that list of customers also included Telstra that backs the muru-D program, however when asked that question, Liau chose not to comment, instead refocusing the interview back to the company’s overall vision and goals. That vision according to Liau is to be the platform that everybody uses when it comes to assessing and validating the candidates, so the CrowdSourceHire team is pushing for that kind of adoption as hard as it can. Although acutely aware that down the track a round of seed funding is going to help accelerate that goal, Liau told Startup Daily that strategically they will not be jumping right onto that post demo day as the company is currently talking to investors and weighing up its options. As such, opening a round a bit later probably makes more sense. In terms of expansion, it seems Australia may not be the place where CrowdSourceHire can scale as fast as it would like. Liau has said that post demo-day he will be heading to South-East Asia to scope out the increasing number of opportunities the team are seeing there. This move could also explain the need to halt raising funds immediately. “From all the research, we’ve been finding a lot of the skills labour is actually coming up within the South-East Asian countries,” says Liau.